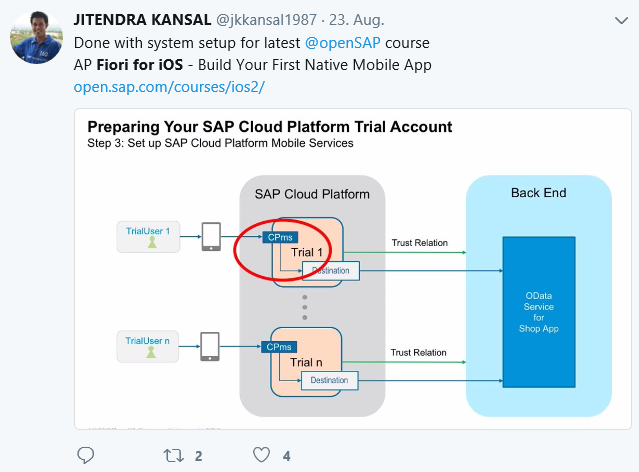 The openSAP course, SAP Fiori for iOS – Build Your First Native Mobile App, has completed and I just closed the discussion forums and sent the final mail announcing the publication of the course certificates. Now is the best time to share some key metrics and experiences of this course with you. SAP Fiori for iOS – Build Your First Native Mobile App was delivered by the instructors Hansi Richstein, Andreas Schlosser and Marita Krümpelmann. Richard A. Knowles, general manager for the SAP and Apple partnership, announced the course via the teaser video and Anja Kutscher was acting as course architect. On top many passionate experts helped behind the scenes and supported the discussion forum. Just to mention a few: Niels Hebling, Denise Nepraunig, Peter Sutter and many more. The course started officially on August 29 and continued over four weeks with a final exam finishing on October 4. But we opened the course some days earlier on August 23 because Marita had prepared 4 video units and a step-by-step documentation for the system setup. 8,778 learners were enrolled when Course Week 1 started on August 29. When the course closed, this number had increased to 13,228. We issued 1,030 graded Records of Achievement. 1,618 posts were created in the discussion forum. In November/ December 2016 we delivered a very well perceived first openSAP course about SAP Fiori for iOS. Still a lot of people register for this course, today I count 14,650 enrollments. The scope of this first iOS course is to provide an overview about the impact of the Apple and SAP partnership. As the course was held before the availability of the SAP Cloud Platform SDK for iOS, we promised that we would follow-up with a course with focus on using the SDK for business app development. 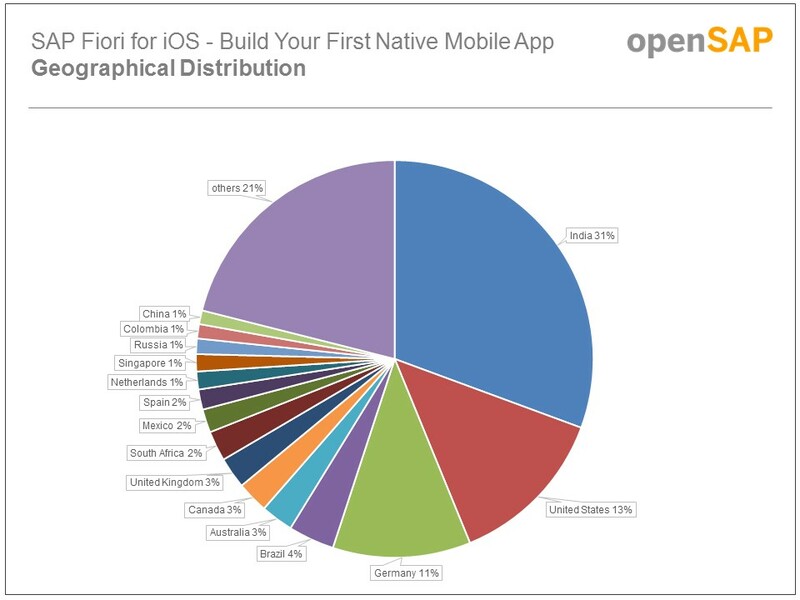 With SAP Fiori for iOS – Build Your First Native Mobile App we kept this promise. To share some stats: From the 10,352 learners that took part in the first introduction course ~37% enrolled in our new offering. I want to start this blog article with a view on the hands-on exercises and the discussion forum. The practical development exercises started in course week 1 and ended in the last course week 4. While Andreas provided insights about SAP Fiori for iOS and the SDK, Hansi showed and explained the single steps of building a sample shop app in the video units. These demonstrations were complemented with detailed hands-on descriptions containing also code for easy copy and paste. At the end of each exercise document our expert team provided sample solutions for download, to enable learners to continue with proper coding in case they missed a step or produced an issue that would prevent them from continuing. Throughout the entire course period people were invited to ask questions or report their problems with the exercises in the discussion forum and our experts did an awesome job in answering these questions and helping people to get back on track. I can tell that there happened a lot behind the scenes, e.g. the SAP Cloud Platform Mobile Services team fixed individual issues directly in the accounts and Hansi or Niels asked students to send them their personal development project to evaluate deeper and to provide direct guidance. This is what I call prime support in a free-of charge course offering! Many learners made use of the discussion forum, especially in regards to the hands-on exercises. After closing the forum, I count 1,618 posts (questions, comments and answers)! Therefrom ~80% are about the hands-on exercises, while only ~ 10% deal with general topics like questions about the openSAP platform or the assignment deadlines and ~10% is learner feedback from the I like, I wish section. And I can share another number: In our course end survey, we always ask our learners which elements they found most effective for their learning – and in this course more than 70% of the learners who answered that question selected the option “Practical system exercises”. This is the highest value I have ever seen for this option in an openSAP course. This all demonstrates that the intended practical focus of the course worked out. I would like to thank Hansi , Andreas and the entire team of SAP Academy SDK for iOS for designing and presenting the course. Course Structure and the course content was substantial. I felt no issue to implement the course content. It was nice and easy. After each exercise when the app was build and run successfully in Simulator i can’t express that in words. I like to give Special Thanks to Andreas for supporting me with in and outside the course. I am a ABAP programmer who started learning SWIFT as passion. Now this course really guided my way to be a full stack developer for SAP FIORI on IOS. 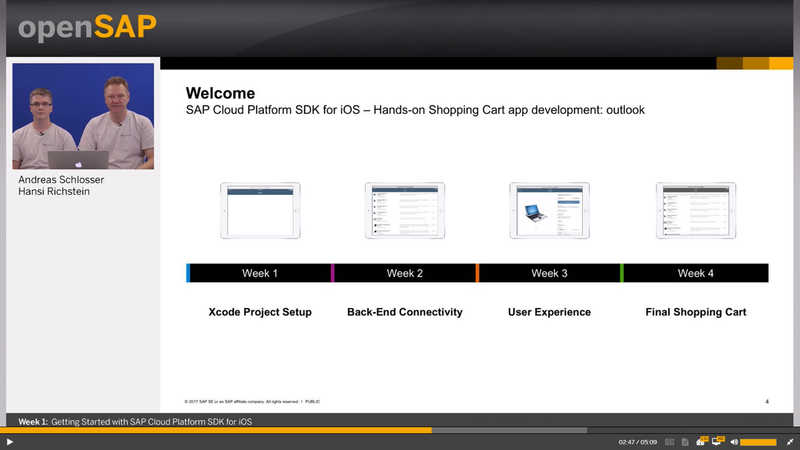 This course gave a strong hold for me to get onboard onto SAP IOS SDK. I really liked this course, great job openSAP! I did all the tutorials on developers.sap.com but it’s great to also build an app “from scratch”. We didn’t learn how to connect to our own backend but this is covered in the Mobile Services tutorials and this is not directly related to the SDK so it doesn’t really matter. What I really liked is the best practices outlined during the course and the quality of the code. It’s not just some really simple code that we know we won’t be able to reuse in a real app. Course participants came from 103 different countries, whereof 15 countries are equal to or above the 1 % threshold. Three countries account for 55% of all enrollments for this course. Like in most openSAP courses the three countries with the highest enrollment % are India, Germany and the United States. The age of participants spans from 16 to 74. 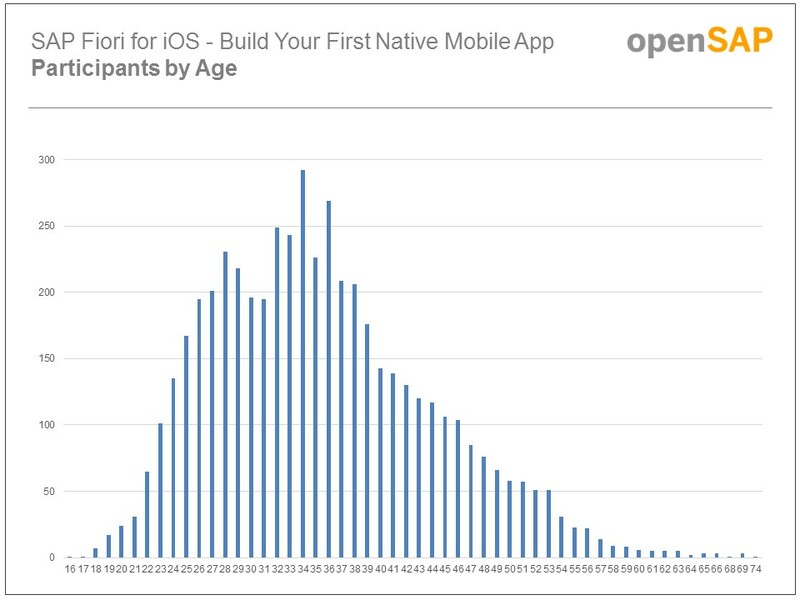 You see that most course participants are from age 22 to 53, and that there is a peak between 24 and 40. These numbers fit to another figure: 94,5% of the course participants are (IT-) professionals, while ~5,5% are students. Looking deeper into the IT Background that course participants have maintained in their profile: 49% evaluate themselves as IT experts, 37% as advanced and 14% as beginners in IT. In short you can read that the clear majority of participants are advanced or experts in IT and are between 24 and 40 years old. We use the number of enrollments at the middle of the course to measure the success rate. Why? Because we say that all people that enroll until the middle of a course still have a realistic chance to complete it with a Record of Achievement. From the 10,756 participants that were enrolled in the middle, 1,030 learners earned a Record of Achievement for the course – this leads to the success rate of 9,6%. To be part of the top 5% course participants needed to earn 237 points, for the top 10% they needed 233 and for the top 20% they needed 227,5 points. 26 participants earned a Record of Achievement with 100% and are part of the top 5%. This means they answered each and every assignment question correctly. Hats off! At the end of each openSAP course we run a short survey to ask our participants about their feedback on the course and their learning experience on openSAP. In sum 844 learners took part in this course survey. I already referred to the question “Which learning elements did you find effective for your learning in this course?” when writing about the hands-on focus. From the ones who answered this question, 91% selected “Video”, 72% “Practical system exercises”, 69% “Assignments/Exam”, 67% “Self-tests” and 27% “Discussion Forum”. The question “How satisfied are you with the course content?” was answered by 55% with “Very Satisfied” and by 42% with “Satisfied”, while 3% were not satisfied. The question “Do you think the skills taught in the course will help you in your (future) work?” was answered by 96.1 % with “Yes”. The question “How satisfied are you with the openSAP learning experience?” was answered by 65% with “Very satisfied” and by 34% with “Satisfied”. Beside the survey, we always open a “I like/ I wish” forum section during the last course week to hear what learners liked most and what they would wish for the future. We got the feedback that many participants liked this course and plan to continue their learning journey about native iOS app development for the enterprise. Specifically some learners mentioned that they would love to continue with onboarding and further backend integration topics and push notifications. Also, some learners clearly wish that they can upgrade their sample app to the recent Xcode and SDK release, something we will follow up on. “Many Thanks for a great course….in spite of just knowing a tiny bit about SWIFT – Dear Open SAP Team. Congratulations for the course, in every step you could see the team effort and how it build to reach a successful end. Great Course project management work, great teaching. I am assuming that the environment that you build was in good part a key factor in your success. Before I finalize this blog, I want to say thanks to Tani for compiling the reports and to all participants and experts for making this learning journey possible. Please be aware that this blog post conveys my own, personal interpretation of the metrics we have gathered. We followed the course on OpenSAP.. But unfortunately on Xcode9 with latest SAP SDK the project don’t work. The course is based on some pre built Base project which won’t support on Xcode9. Please help us If you have any info on that. “This course is in self-paced mode now and the discussion are closed. This means that questions regarding the hands-on exercises cannot be answered anymore by our experts. 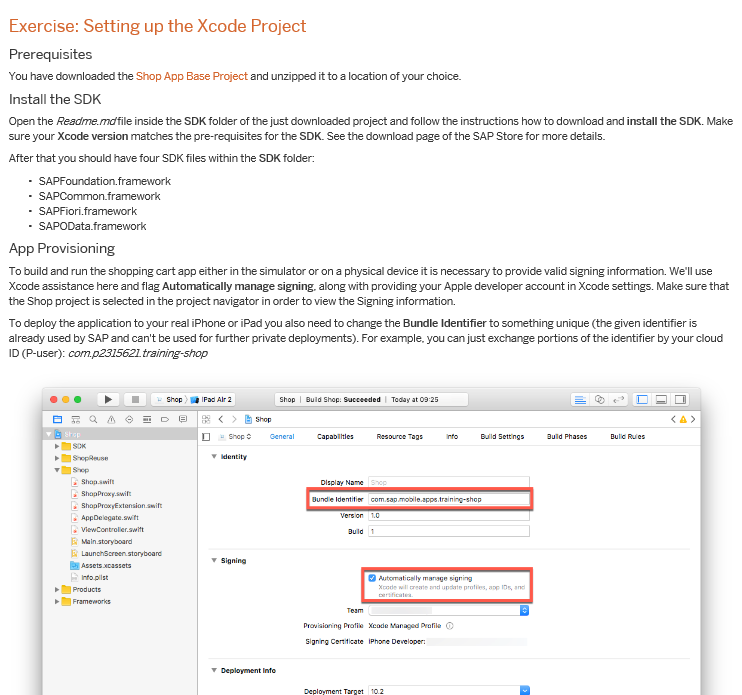 If you want to try to build the shown sample app on your own please take into account that the exercises were built with the SAP Cloud Platform SDK for iOS 1.0 and Xcode 8.3.